Simply saw out two giant feet and secure them with leather straps. A multi-layered wooden board with a thickness of approx. 2 cm is suitable. 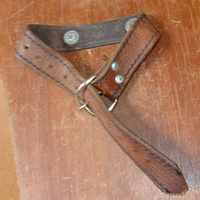 For the straps, a leather belt or roller-blind belt can be used. The two straps are screwed to the wood using wooden screws and washers for re-enforcement. An ideal game to play in varied locations. It is not so easy to walk with these feet; however they are ideal for outdoor competitions. A contribution from Ronnie Berzins.